Trader Joes has the best version of this soup, but here’s my version of it. Line a deep baking sheet with foil and spray a thin layer of olive oil. Place the tomatoes and red pepper (whole) on top. Remove from oven and set aside until brought down to room temperature. 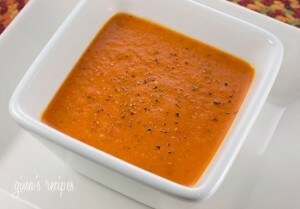 Puree the tomatoes, basil, and peppers until they are a smooth texture. Saute with some olive oil over medium heat until boiling point. Stir in heavy cream, and reduce heat to low and simmer for 15 minutes.